Ghrelin which is a modulating hormone and in essence optimizes the balance between the “on” hormone & the “off” hormone. Before Ghrelin was discovered the synthetic growth hormone releasing peptides (GHRPs) were created and are superior to Ghrelin in that they do not share Ghrelin’s lipogenic behavior. These GHRPs are Ghrp-6,GHRP-2, hexarelin and later Ipamorelin all of which behave in similar fashion. The analog in the above quoted study resisted degradation for 30 minutes. The quote implies that if your analog can last 30 minutes it has tapped out the potential for a single pulse. Since another pulse won’t be generated for about 2.5 – 3 hours analogs that last more than 30 minutes up to 3 hours are not any more beneficial. You would need an analog that kept growth hormone releasing hormone around beyond 3 hours to have it trigger a second pulse. Otherwise dosing the 30 minute analog every 3 hours will maximize GH output OR you could just use an analog such as cjc-1295 which lasts for many days and will trigger several GH pulses a day for several days on a single dose. The saturation dose in most studies on the GHRPs (Ghrp-6, GHRP-2, Ipamorelin & hexarelin) is defined as either 100mcg or 1mcg/kg. What that means is that 100mcg will saturate the receptors fully, but if you add another 100mcg to that dose only 50% of that portion will be effective. If you add an additional 100mcg to that dose only about 25% will be effective. Perhaps a final 100mcg might add a little something to GH release but that is it. A 500mcg dose will not be more effective then a 400mcg, perhaps not even more effective then 300mcg. The additional problems are desensitization & cortisol/prolactin side-effects. Ipamorelin is about as efficacious as Ghrp-6 in causing GH release but even at higher dose (above 100mcg) it does not create prolactin or cortisol. Ghrp-6 at the saturation dose 100mcg does not really increase prolactin & cortisol but may do so slightly at higher doses. This rise is still within the normal range. GHRP-2 is a little more efficacious then Ghrp-6 at causing GH release but at the saturation dose or higher may produce a slight to moderate increase in prolactin & cortisol. This rise is still within the normal range although doses of 200 – 400mcg might make it the high end of the normal range. hexarelin is the most efficacious of all of the GHRPs at causing an increase in GH release. However it has the highest potential to also increase cortisol & prolactin. This rise will occur even at the 100mcg saturation dose. This rise will reach the higher levels of what is defined as normal. GHRP-2 probably at saturation dose several times a day will not result in desensitization. hexarelin has been shown to bring about desensitization but in a long-term study the pituitary recovered its sensitivity so that there was not long-term loss of sensitivity at saturation dose. 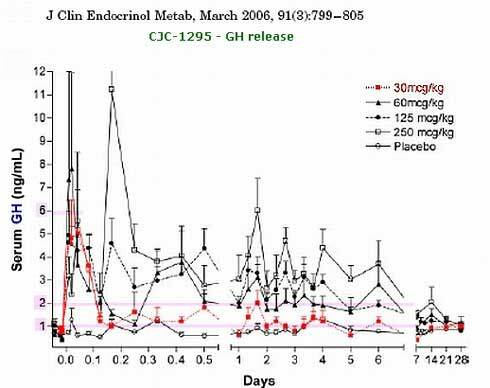 However dosing hexarelin even at 100mcg three times a day will likely lead to some down regulation within 14 days. If desensitization were to ever occur for any of these GHRPs simply stopping use for several days will remedy this effect. Now Sermorelin, GHRH (1-44) and GRF(1-29) all are basically GHRH and have a short half-life in plasma because of quick cleavage between the 2nd & 3rd amino acid. This is no worry naturally because this hormone is secreted from the hypothalamus and travels a short distance to the underlying anterior pituitary and is not really subject to enzymatic cleavage. The release from the hypothalamus and binding to somatotrophs (pituitary cells) happens quickly. However when injected into the body it must circulate before finding its way to the pituitary and so within 3 minutes it is already being degraded. That is why GHRH in the above forms must be dosed high to get an effect. All GHRH analogs swap Alanine at the 2nd position for D-Alanine which makes the peptide resistant to quick cleavage at that position. This means analogs will be more effective when injected at smaller dosing. The analog tetra or 4 substituted GRF(1-29) sometimes called CJC w/o the DAC or referred to by me as modified GRF(1-29) has other amino acid modifications. They are a glutamine (Gln or Q) at the 8-position, alanine (Ala or A) at the 15-position, and a leucine (Leu or L) at the 27-position. The alanine at the 8th position enhances bioavailability but the other two amino substitutions are made to enhance the manufacturing process (i.e. create manufacturing stability). For use in vivo, in humans, the GHRH analog known as CJC w/o the DAC or tetra (4) substituted GRF(1-29) or modified GRF(1-29) is a very effective peptide with a half-life probably 30+ minutes. That is long enough to be completely effective. The saturation dose is also defined as 100mcg. The problem with using a GHRH even the stronger analogs is that they are only highly effective when somatostatin is low (the GH inhibiting hormone). So if you unluckily administer in a trough (or when a GH pulse is not naturally occurring) you will add very little GH release. If however you luckily administer during a rising wave or GH pulse (somatostatin will not be active at this point) you will add to GH release. The solution is simple and highly effective. You administer a GHRH analog with a GHRP. The GHRP creates a pulse of GH. It does this through several mechanisms. One mechanism is the reduction of somatostatin release from the hypothalamus, another is a reduction of somatostatin influence at the pituitary, still another is increased release of GHRH from the brain and finally GHRPs act on the same pituitary cells (somatotrophs) as do GHRHs but use a different mechanism to increase cAMP formation which will further cause GH release from somatotroph stores. GHRH also has a way of reciprocally reinforcing GHRPs action. The result is a synergistic GH release. Together the GH is not 7 (5+2) it turns out to say 16! A solid protocol would be to use a GHRP + a GHRH analog pre-bed (to support the nightime pulse) and once or twice throughout the day. For anti-aging, deep restful restorative sleep, the once at night dosing is all you need. For an adult aged 40+ it is enough to restore GH to youthful levels. However for bodybuilding or fatloss or injury repair multiple dosings can be effective. The GHRH analog can be used at 100mcg and as high as you want without problems. The Ghrp-6 can always be used at 100mcg w/o problems but a dose of 200mcg will probably be fine as well. Again desensitization is something to keep an eye on particularly with the highest doses of GHRP-2 and all doses of hexarelin. So 100 – 200mcg of Ghrp-6+ 100 – 500mcg+ of a GHRH analog taken together will be effective. This may be dosed several times a day to be highly effective. A solid approach is a bit more conservative at 100mcg of Ghrp-6+ 100mcg of a GHRH analog dosed either once, twice, three or four times a day. The difference is once a day dosing pre-bed will give a youthful restorative amount of GH while multiple dosing and or higher levels will give higher GH & igf-1 levels when coupled with diet & exercise will lead to muscle gain & fatloss. Administration should ideally be done on either an empty stomach or with only protein in the stomach. Fats & carbs blunt GH release. So administer the peptides and wait about 20 minutes (no more then 30 but no less then 15 minutes) to eat. AT that point the GH pulse has about hit the peak and you can eat what you want. Context: Pulsatile GH secretion is considered important for many of the hormone’s physiological effects. Short-term GHRH infusions enhance GH pulsatility and increase IGF-I, but the short GHRH half-life limits its therapeutic use. A synthetic GHRH analog (CJC-1295) that binds permanently to endogenous albumin after injection (half-life = 8 d) stimulates GH and IGF-I secretion in several animal species and in normal human subjects and enhances growth in rats. Objective: Our objective was to assess GH pulsatility after a single injection of CJC-1295 and determine which GH secretion parameters correlated to the increase in IGF-I production. Methods: GH pulsatility was as sessed by 20-min blood sampling during an overnight 12-h period in healthy 20- to 40-yr-old men before and 1 wk after injection of either 60 or 90 µg/kg CJC-1295. Results: GH secretion was increased after CJC-1295 administration with preserved pulsatility. The frequency and magnitude of GH secretory pulses were unaltered. However, basal (trough) GH levels were markedly increased (7.5-fold; P < 0.0001) and contributed to an overall increase in GH secretion (mean GH levels, 46%; P < 0.01) and IGF-I levels (45%; P < 0.001). No significant differences were observed between the responses to the two drug doses. The IGF-I increases did not correlate with any parameters of GH secretion. Conclusions: CJC-1295 increased trough and mean GH secretion and IGF-I production with preserved GH pulsatility. The marked enhancement of trough GH levels by continuous GHRH stimulation implicates the importance of this effect on increasing IGF-I. Long-acting GHRH preparations may have clinical utility in patients with intact pituitary GH secretory capability.